While “meaning negotiation” has become an ubiquitous term, its use is often confusing. A negotiation problem implies not only a convenience to agree, but also diverging interest on what to agree upon. It implies agreement but also the possibility of (voluntary) disagreement. In this chapter, we look at meaning negotiation as the process through which agents starting from different preferred conceptual representations of an object, an event or a more complex entity, converge to an agreement through some communication medium. We shortly sketch the outline of a geometric view of meaning negotiation, based on conceptual spaces. We show that such view can inherit important structural elements from game theoretic models of bargaining – in particular, in the case when the protagonists have overlapping negotiation regions, we emphasize a parallel to the Nash solution in cooperative game theory. 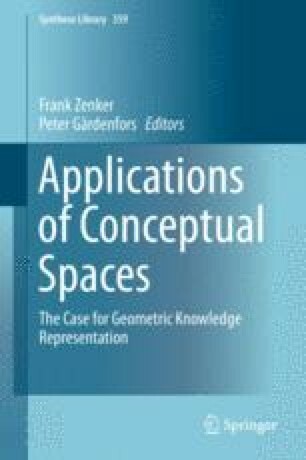 When acceptable solution regions of the protagonists are disjoint, we present several types of processes: changes in the salience of dimensions, dimensional projections and metaphorical space transformations. None of the latter processes are motivated by normative or rationality considerations, but presented as argumentation tools that we believe are used in actual situations of conceptual disagreement. Massimo Warglien recognizes financial support by the MatheMACS project, funded by the European Commission under the 7th Framework Programme Grant #318723. Peter Gärdenfors thanks the Swedish Research Council for support to the Linneaus environment Thinking in Time: Cognition, Communication and Learning.